Place the freshly picked tips of the nettles into a large saucepan, together with the rind of the lemon. Add the water and boil, simmering for half an hour. Strain this nettle liquor into a cleaned fermentation bucket, adding the sugar and mixing well. The cream of tartar should also be added at this stage. Start the brewing yeast in a separate container and add to the nettle mixture (cooled). Add the juice of the peeled lemon and leave in a warm spot. Strain into suitable screw-top bottles after just three days and store in a cool place. Leave for a further week or two before drinking. 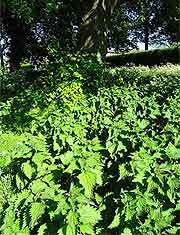 Nettle Beer recipe - More Wine Recipes.